There are various different types of glaucoma but essentially the condition arises if the pressure inside the eye (intraocular pressure) is too high for the eye. If this occurs then damage will occur to the eye. The damage that occurs is a reduction in the visual field of the eye or the peripheral vision. This peripheral vision becomes less sensitive and then disappears gradually over time. The peripheral vision can slowly march towards the centre of the vision and if no treatment is undertaken the central vision of the eye can be lost resulting in blindness. 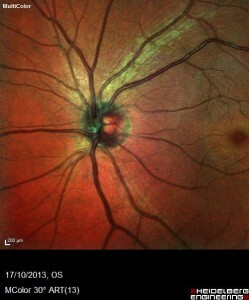 The best way to think of glaucoma is to think of the eye as a ball. Fluid is continually being pumped in to the eyeball and is continually draining out in another part of the eye. In glaucoma either the pumping of fluid in to the eye is too fast or the drainage of fluid from the eye is too slow. As a result of this the pressure inside the eye elevates and causes damage to the eye. There are essentially two types of acquired glaucoma. in this condition the pressure inside the eye elevates very rapidly and results in a painful red eye with reduced vision. If this is not treated very quickly it can result in permanent loss of vision in the eye. Many types of drops and tablets are required to reduce the pressure and following this the eye may require laser treatment in the form of a peripheral iridotomy. For this treatment a small hole is made in the iris, or coloured part of your eye, with the laser to try and help the circulation of fluid in the eye and reduce the pressure. If this does not reduce the pressure sufficiently then further surgery may be required to do so. The surgical gold standard at present is known as a trabeculectomy. in this condition the pressure inside the eye gradually elevates and slowly damages the eye. To reduce the pressure inside the eye drops are put in to the eye. These drops can either reduce the amount of fluid being pumped in to the eye or they can increase the drainage of fluid from the eye. Some drops are used once a day whereas others may be used up to four times a day and often multiple drops can be used. In some patients the pressure does not reduce low enough and tablets (Diamox – Acetazolamide) can be added to the drop regime. The intraocular pressure and the visual field damage dictate the number of drops and/or tablets required. If the drops and/or tablets do no control the pressure inside the eye sufficiently then one has to consider further alternatives including, laser treatment to the eye (laser trabeculoplasty) and/or formal surgery (trabeculectomy). this is measured with a small prism that comes near to the eye and is used with blue light and fluorescent dye. You may have had the pressure checked at your Optometrists previously with an air puff type tonometer. the visual fields are plotted via a computerised system. You will simply be asked to press the button every time you see a light in your peripheral field and is painless. we have the latest Heidelberg Spectralis scanner. 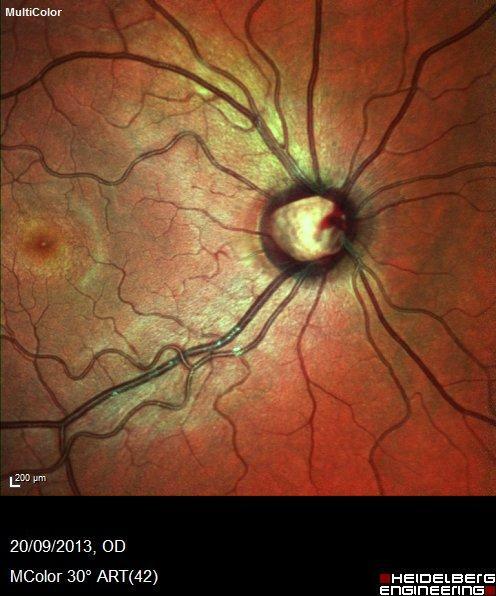 This is able to scan the nerve fibre layer at the back of your eye and can detect changes before other methods and is a helpful test in diagnosing and monitoring glaucoma. this allows direct comparison of the nerve at the back of your eye over time. Laser trabeculoplasty and Trabeculectomy can be used to reduce the intraocular pressure of the eye and help prevent further damage.